An exceptional, seamless musical scrapbook, The Last Bison’s third album ‘SÜDA’ captures the urgency of memory with energy, vigor, and emotion. We borrowed from our oldest memories, and reimagined that childlike wanderlust we all had before the pains of coming of age came into view and we were snapped back to reality. The Last Bison’s third album, SÜDA, could be described as more of a musical scrapbook than anything else. Diving back into childhood memories of adventure and loss, the Virginia three-piece of Ben Hardesty, Andrew Benfante, and Amos Housworth jumps between tracks with a vigor that makes it impossible to guess what’s coming next. 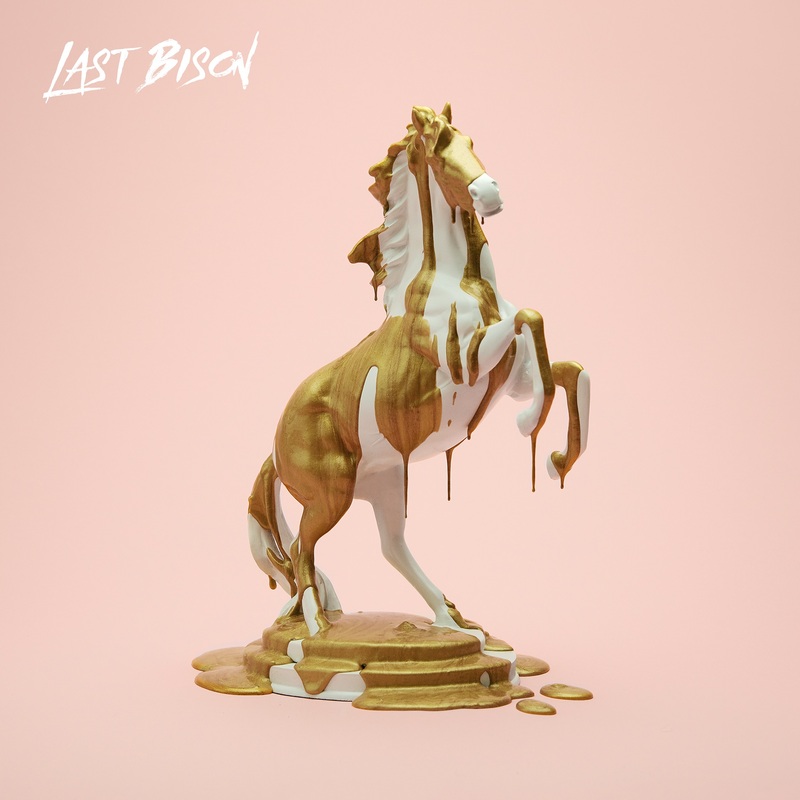 Due in part to the exceptional range of frontman Ben Hardesty’s vocals, The Last Bison manage to try on a variety of sounds and still come together seamlessly. Songs such as “Cold Night” and “Blood” pull with a high-energy nostalgia, capturing the urgency of memory and its lasting significance. Atwood Magazine is proud to be premiering SÜDA, The Last Bison’s third album (out September 21, 2018 via AntiFragile Music). The album is nothing, if not a journey. Having moved from the United States to South America as a child, Ben Hardesty is no stranger to adventure, and his memories from this experience embody themselves in each track. “I feel that songs are always there, just waiting to be found and written down,” he tells Atwood Magazine. Plenty of albums toil with love lost and adventures of the past, but SÜDA’s meta quality of remembering both emotion and circumstance makes it all the more personal. The buildup in “Blood” leads to the charged line, “For a moment there you taught me to feel.” Perhaps the strongest song on the album, “Blood” combines a contagious beat with Hardesty’s ever-versatile voice to bring two sides to the story. One minute it’s shadowy, intentional and scheming, the next it’s raw and hurting. The Last Bison’s ability to pack so much into each track speaks to their belief that SÜDA‘s songs were “waiting to be found,” rather than written. Experience the full record via our exclusive stream, and peek inside SÜDA with Atwood Magazine as Ben Hardesty goes track-by-track through the music and lyrics of The Last Bison’s new album! We try to capture the feeling of being young and fiercely loyal. Being amidst the scary and exciting novelty of experiencing everything for the first time which, in a way, makes it the perfect opener to a record about discovery and newness. It’s hazy and not bound by time, floating and expansive and unsure. It also marks a drastic departure from the sound of our older material right off the bat. We all have memories of experiences that deeply affected the way we individually view the world and the people around us. As we grow older many of the details of those memories begin to fade. For me often times I don’t realize how significant those moments were until trying to recall them years later. This song is an internal dialogue about that process. It is about me sitting by the fire on a cold night trying to connect the dots and fill in the missing details of a distant memory. A distant memory that seemingly changed my perception, a memory that I’m just far enough removed from that I can’t put every piece together. As a kid I lived near a river in the rainforests of Bolivia. It was said that gold flakes would make their way down the river and if you were lucky enough, you could pan them out. I was four years old when my parents took us from the swamps of Virginia to the jungles of South America. This song is about the paths we take and how they form us into who we are. It is about being vulnerable to that process and learning to enjoy the journey, whether we find the gold flakes or not. There are moments in life that we look back on almost as if they are snapshots. We see them in our memories as a single frame of a bigger picture. This song is a recalling of one of those moments. I was traveling and was out late one night in Edinburgh. I was sitting in a corner booth at a favorite jazz club and fell asleep. When I woke not thirty minutes later, the place was packed and the floor was full of people dancing to the music. I didn’t want it to pass so I stood up and started dancing with strangers. No strings attached, no agendas, just dozens of people enjoying an experience together that nobody could take away. Moments like these breathe new life into us. Loss is an unfortunate reality. But it happens to us everyday in some capacity. It is usually unexpected and unplanned. However, occasionally we see it coming and can fight to keep what we’re losing. This song came from a time where I wanted nothing more than to hold on to what I thought was slipping away. SÜDA is the title track because it holds a sense of excitement, anxiety, and uncertainty that so often accompanies exploring a new place or stumbling into circumstances that force your perspective to grow, which mirrors the album’s themes. The A-section is tense and driving, devolving into chaos that leads into the meditative and echoing B-section that builds into a loud and explosive reprise of A-section before fading out to nothingness: a metaphor for cycles in my life. ‘Dixieland’ in the choruses refers to a headspace to fall back on in times of trouble that, while filled with nostalgia and comfort, in reality is much harsher and filled with old and self-destructive habits and ways of thinking; a familiar yet ultimately unhealthy way to get by. The process of truly getting to know someone is awkward and clumsy. When it’s worth it, we gladly push through the tension time and time again to what our sights are set on. This song is is written from the midst of that tension, looking forward to a time of resolution and completion. Life is so much better when we lean on people. We too often try to do things alone, sometimes to the extent that we replicate others actions just to be independent. Often those actions don’t play into our strengths. This song is about realizing we need to let go and let other people step in to help us. I have a hard time leaving the people I love. Especially those who live far from me. The distance in between becomes loneliness and that can sneak its way into our perspective. This song is about learning to be fully in those moments that we have with the people we love. If we are only looking at the separation that is inevitable, the time spent with loved ones will be tainted and fleeting. This song is about the loss of innocence. We gradually grow up and are exposed to the pain our world can bring. If we don’t reach out and lean on the people around us, and let them lean on us, we will without a doubt feel alone. As true as that often seems, we are not alone. A song about remembering the smell of your grandmother’s house, or the feel of a lost lover’s touch; the uncomfortable heat of standing too close to a bonfire on a cold night. Weddings and funerals and fights and love making. A song about craving sacred moments at times when you feel like they’ll never exist again.